Well actually they all were tonight. The entire team played fantastic, but Jeffrey was the hero of the night with his 2 goals, including at overtime game winner. Staal had the other. 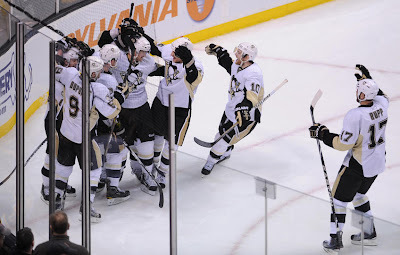 It's hard to look back and find too many games that the Pens worked harder than they did today, and they finally were rewarded for their hard work with a 3-2 overtime victory against Boston Saturday night. The unsung hero of the game has to be Ben Lovejoy, whose quick stick saved a goal that slipped past Fleury early in the 1st. Then he got down on one knee and showed off his Game 6 Scuderi impression to make a few more saves. If that one goes in, who knows if the Pens would have been able to recover at all. Kris Letang strapped down his jersey tonight. Best game I've seen from Rupp in a while. Not only are his fists on top of their game, but his skating was superb tonight. He is playing like he wants to keep his spot when Kunitz comes back. Talk all you want about James Neal not scoring yet, but anyone who says that he has played poorly probably isn't watching very many games. Neal is not only grinding it out on the forecheck, but he is also distributing the puck quite a bit too. Once he gets a little more comfortable shooting than his production will go right back up. Normally, I would say that the fact that the Pens gave up another late goal is a problem that needs to be addressed, but we're at the point in the season where 2 points is 2 points no matter which way you get em. Speaking of which, the Flyers lost today. The Pens have pulled within 2 points of the Flyers, but I wouldn't get too excited just yet. I am keeping track of the deficit through "potential points," meaning that every game the Flyers have on Pittsburgh is another 2 points they have the opportunity to get. Of course, there is another way to avoid the Caps in the 1st round. Tampa has found themselves in a spot of bother recently, and the Caps have pulled within 1 point of them. I wouldn't be too upset with that first round matchup, with or without a certain center who wears number 87. But we got 15 more before that. Flyers play a biggie tomorrow against the Rags on NBC prime time, and if they lose than the number drops to 6.